1922 – The Lawrences arrived in America and settled down in Taos at the invitation of the ranch’s former owner Mabel Dodge Sterne (later Luhan). Lawrence’s first visit to the ranch was in October. 1925 – Lawrence recovered from illness at the ranch while writing the play David, producing significant essays like “Art and Morality” and “Reflections on the Death of a Porcupine,” and revising part of his novel The Plumed Serpent. Ranch improvements included construction of the cowshed and the installation of water pipes for irrigation. 1931 – Frieda Lawrence and Angelo Ravagli (on six-month visa) inspected the ranch’s condition. Frieda began memoirs of her life with D.H. Lawrence. 1933 – Frieda began residency with Ravagli who constructed a new log cabin (presentcaretaker’s cabin) in place of the “guest cabin,” which was torn down and recycled. 1934 – Frieda published her book on D.H. Lawrence, Not I But the Wind. . . , and Ravagli built the Lawrence Memorial. 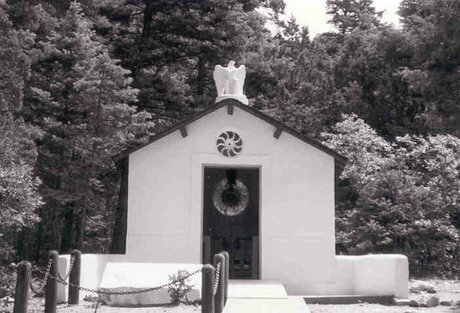 1935 – Lawrence’s ashes were transferred from France to the Lawrence Memorial at Kiowa Ranch.